This covers a whole range of situations. 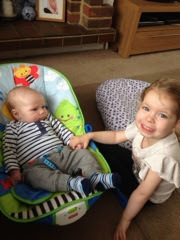 Whether it be touching her brother on his head and really close to the soft spot!!! Or when she's picking something up that could break/squeeze out/crush, it's my go to word. "Don't wake your brother up!" Now this, I admit, is a fairly new addition but used the most at the moment. It always seems that as soon as he goes to close his eyes, her decibel levels rise and rise and rise. Or after I've rocked him and paced up and down and nearly lost my mind because he is crying and she is demanding my attention, he goes to sleep and she decides in that split second to cry herself or wave objects near his mat. We have so many near misses! I'm slightly ashamed to say this is usually said it a slightly terse tone. It's just that as soon as I pick him up or pay any attention to him, she's on me. She wants something done just as I sit down to feed him or decides that it's a good time to do a poo and demands I wipe her bum (at all other times she is happy to sit on potty for what seems like hours, I have to bribe her off it). This is also used whilst I'm cooking her dinner, she can ignore me for ages and then...boom...as soon as I do something else she is on my case. These are usually said together as I'm struggling to put the buggy together or we are walking along. Bubba gallops off and I'm constantly shouting "wait". Thankfully she stops but I reckon it's only a matter of time before she keeps going. I often find myself saying this when she is talking, believe me the girl can talk and often it comes out all at once. This one even Bubba has adopted when I ask her to do something. She even says it in the same tone as I do, in a slightly harassed mother of two way! Whoops. But this is usually coupled with a softer tone (god knows how) whilst she is having a tantrum and I usually tell her "everything is going to be ok" to calm her down.